Book Drunk: Review ~ Third to Die by Carys Jones. Publication Date: January 10, 2015. Aiden Connelly has settled in to life in Avalon and is developing a reputation as an attorney who will fight for the truth … no matter what enemies he makes along the way. But when he is asked to look into the tragic death of an old friend ten years before, Aiden is drawn back to his hometown of Greensburg, the town he eagerly fled as a teenager. As the ghosts from Aiden’s past resurface, and new dilemmas rise up to challenge him in Avalon, Aiden begins to wonder if everything he holds true has been built on lies. Third to Die is book three in Carys Jones’ wonderful Avalon series, and it’s my favourite so far. Though I have loved both First to Fall and Second to Cry, the third instalment had much more depth to it and dare I say, our main character Aiden has started to win me over a little… Third to Die combines several genres into one, with different strands of storyline all combining into one gripping novel. There’s the romance, if you can still call it that, between Aiden and Isla which has developed into quite the page turner as the series has progressed. We’re also given the mystery in another enthralling case as Aiden investigates the death of an old friend. And as always, this book is full of suspense as we’re provided with a story full of twists and one which could simply go anywhere. I have become a massive Carys Jones fan. Like the previous two books, I can’t go into the case too much because it’s strongly written, complex and way too easy to give away if I try and talk about any of it. Reading the case has always been my favourite part in the Avalon series, however, and I love how different each one has been. Though I don’t think any will top the case in First to Fall for the wow-factor, I thought this one was the most well-written, something a little different and very fascinating. The case weaved in perfectly with the other themes in Third to Die and introduced us to some new characters like Aiden’s old friends Alex and John, who I liked reading from. I loved how the plot naturally transpired to make me care for a character in Aiden who could do nothing right for me in the first two books. The themes in Third to Die are moving and more emotional than I had expected and this really brought out a side to Aiden that I liked – his caring and thoughtful side and a bit more loyalty than I had associated him with. 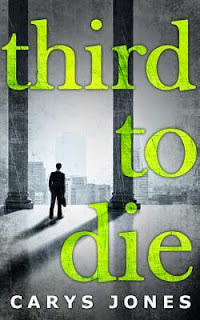 I always enjoy books more when I can connect with the main character and though I know with Aiden that could change at any moment, it really helped to make Third to Die my favourite book in the series. The characters in Avalon do not have lead straightforward lives and there’s always something about to unfold. I love this for entertainment’s sake, always knowing it’s going to kick off at some point soon and there have been plenty of unkind characters in this series willing to make that happen. Having said that, the characters in Third to Die all felt a little more multi-layered and with motives not all that easy to predict. It’s been interesting seeing the development in everyone throughout the series, not just the main characters but the more minor ones too. Carys leaves nothing to be forgotten. This book either had me quickly turning the pages, eager to see what’s next, or reading with a slight lump in my throat at one or two particularly sad scenes. Throughout, it was a great read. Towards the end, the pace felt like it slowed down a little, as things were being linked together and though I prefer the plot when it’s at its relentless fast pace, I did enjoy the moment where I could sit back and appreciate how much has been put into this novel. Even though it’s close, I don’t want this series to end. But I will shout and recommend it plenty of times until Carys brings us book four. I like a good crime book. Haven't read one for a while.